Discover here the top things to do and places to visit (including its vineyards), in this France’s sixth largest city also called the “ World Wine Capital”. Go directly to the section of your choice: Saint Pierre district, Saint Michel district, Pey-Berland district, Golden Triangle, Quinconces and Public Garden , Chartrons and Bacalan district, Bordeaux Vineyards. First of all, go for a walk in the center of Bordeaux and discover here the must-sees of the city. 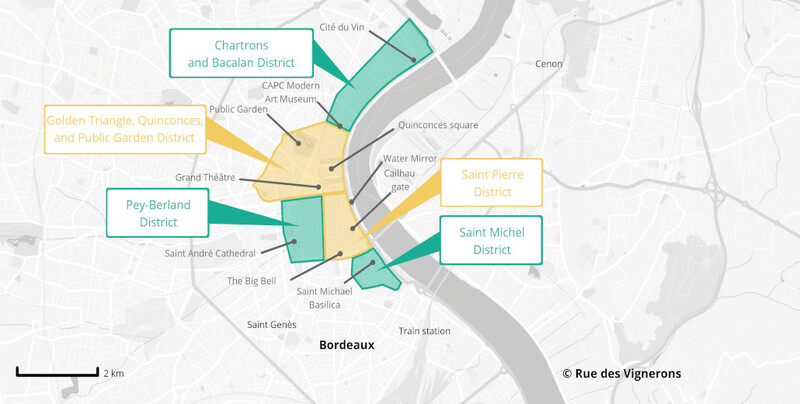 Start with the Saint Pierre district and go to Place de la Bourse to see its famous water mirror, a 2cm’s deep reflecting pool which can rise up to 2 meters and will allow you to admire the reflect of Place de la Bourse and all the other beautiful buildings surrounding. You can go there during the day or at night to take pictures of this most well-known square of the city. In Saint Pierre district you can also see the Porte Cailhau which was a part of the city walls in the 14th century. This monument replaced the original gate at the end of the 15th century. Its small turrets open on the Garonne river and on the oldest bridge of Bordeaux: Le Pont de Pierre. These buildings are also worth seeing at night, including the bridge whose lights are reflected on the Garonne river. Then, go for a walk in the old pedestrian streets of the neighbourhood and go up the Saint James’ street to admire the big bell, the last vestige of the city ramparts. If this door that served as a prison in the Middle Ages has lost its defensive vocation, the Big Bell continues to ring for special occasions. Another street to see in this neighbourhood, the impasse Rue Neuve, where you can see the oldest house in Bordeaux, a hotel dating back to the 14th century. In the south of the Saint Pierre district, going up the Garonne river, you will find the Saint Michel district where you can see the Saint Michael’s basilica. This magnificent architectural ensemble has one of the highest bell towers of France. The Pey-Berland district is located in the west part of Saint Pierre district. You can discover some of the world heritage monuments of Unesco, starting with the famous St. Andrew’s Cathedral. One of the distinctive characteristics of this cathedral is that its bell tower, the Pey-Berland tower, is isolated from the rest of the cathedral. Built one thousand years ago and rebuilt several times throughout centuries, Pey-Berland constitutes a very interesting architectural monument to visit. Climb up the 229 steps of Pey-Berland tower to get to the top. A worth-it effort that will lead you to an amazing sight view with an oversee towards Bordeaux and its historical monuments. The golden triangle district gathers several chic boutiques and some must-sees Bordeaux monuments such as the Grand Théâtre. With one of the most beautiful theatres of the world, this 18th century building is worth the visit. If you have the opportunity to see an opera during your stay in Bordeaux, go and enjoy the paintings and the acoustic. For those who don’t have the time to see an opera, know that guided visits are organized under reservation. Close to Le Grand Théâtre you will find the Esplanade des Quinconces, the biggest square of Europe (it measures 12 hectares, the equivalent of 10 football fields!). Here you can see a famous historical monument: Le Monument aux Girondins (The Girondist Monument), built in order to celebrate the influence of the Girondist during the French Revolution. Throughout the year, the place regularly hosts fairs, sportive and artistic events. Going up to the north of Place des Quinconces, you will arrive in 5 minutes to the Public Garden. This beautiful park is the ideal place for those who like to stroll in a peaceful setting and gaze at the historical bridges, fountains and statues. Chartrons and Bacalan district are located at the north of Bordeaux. The Chartrons is a peaceful and chic place, with shops, galleries, antique shops and trendy restaurants. This former merchant’s district is very dynamic. You will find here La Cité du Vin and one of the most interesting museums of the city. For art lovers or for the curious, the CAPC modern art museum, is a rewarding step. Located close to the public garden, this museum is established in a former warehouse of colonial commodities. A large permanent exhibition of 1300 works reveals the new practices of contemporary art. The architecture of this steeped in history place, sublimates the works on display. After this artistic moment, walk along the Garonne river to reach La Cité du Vin. Inaugurated in June 2016, it is a must see if you want to discover the wine industry, universe around which Bordeaux city has developed. The building has a very original and futuristic architecture. La Cité du Vin has permanent and temporary exhibitions. You will travel through time and space to discover the wine and its history. Bordeaux city is indivisible from its vineyards. Some of the world’s most expensive wines are produced here. The vineyards are commonly called “chateaux” and you will find different types of structures: small family-owned wineries to classified grand cru. For those who stay in Bordeaux without any means of transport, you can easily reach the Pessac Léognan vineyard in the Graves region. Some areas are directly accessible by tram. For heritage lovers, the village of Saint Emilion, a UNESCO world heritage site, is a beautiful combination of architectural beauty and viticultural wealth. The Médoc is located between the Gironde and the Atlantic coast, not far from the famous seaside resorts (Lacanau, Hourtin, Soulac sur Mer …). You can visit classified grands crus on various appellations (Haut Médoc, Margaux, Saint Estèphe, Listrac Médoc …). White wine lovers can discover wines of a very good value for money in the Entre Deux Mers, a vineyard located between the Dordogne and Gironde. For the greediest, the Sauternes appellation is located in South of Bordeaux, about 40 minutes by car. Here you will discover the manufacturing secrets of their sweet white wines, that can easily be paired with some cheeses (Roquefort for example) or foie gras. 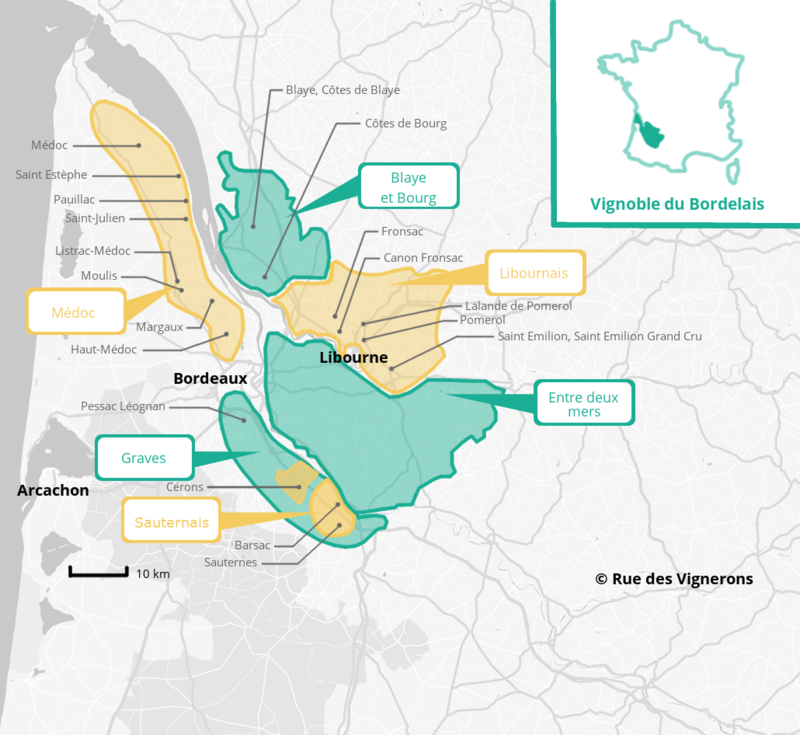 We wish you all a good discovery of Bordeaux and its region!